Dieric Bouts the Elder, The Holy Eucharist Triptych, 185 x 294 cm, earliest dendro-date 1445, Documented date of Painting: 1464-67, St.Peter's Church, Leuven. 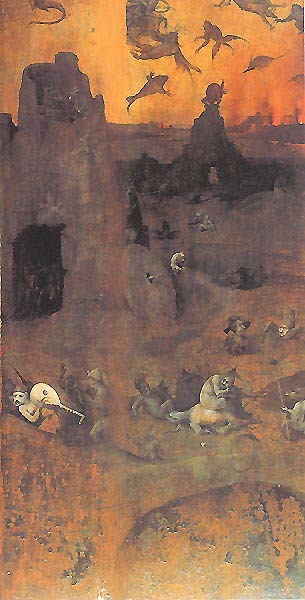 Bouts (1415-75), the city painter of Leuven is a close, elder contemporary of Bosch's. Although Bouts was no revolutionary Bosch shares much with him, especially in subject matter. This commission by the Holy Eucharist Confraternity, arguably Bouts' most important painting, is of special interst to the understanding of Bosch. Bouts had been obliged by the members of the Confraternity to be advised by two learned canons, who would direct him in the Old Testament subjects they wanted him to paint. The two professors at Leuven University, Masters Jan Varenecker and Aegidius Ballawel, appear as "servants" in the back of the central Last Supper, and in a painting on the wall of the room. This apparently not so unusual stipulation took place in the same year in which Jacob became Bosch's learned mentor! The wings of Bout's painting shows four explicitly Jewish ceremonies, in particular a Passover service on the lower left. After this precedent, the details of Bosch's Jewish Wedding at Canaa should not surprise anyone. - To my knowledge neither fact has been referred to in the Bosch literature. 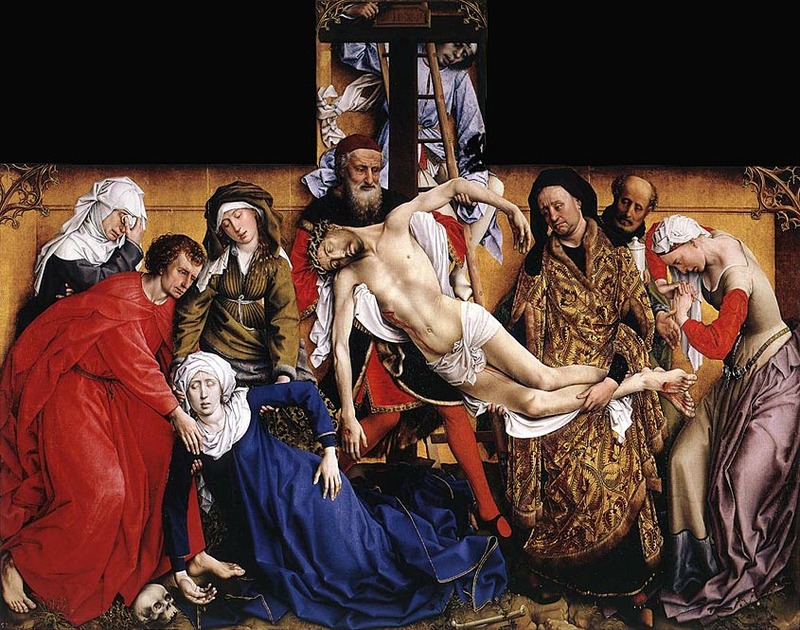 Rogier van der Weyden, Descent from the Cross, 220 x 262 cm, ~1443, originally in the Chapel of the Archers' Fraternity in Leuven, now at the Prado, Madrid. Rogier van der Weyden (1400-1464) was the grand-master of Flemish painting during Bosch's youth, and this painting is his greatest altar triptych. 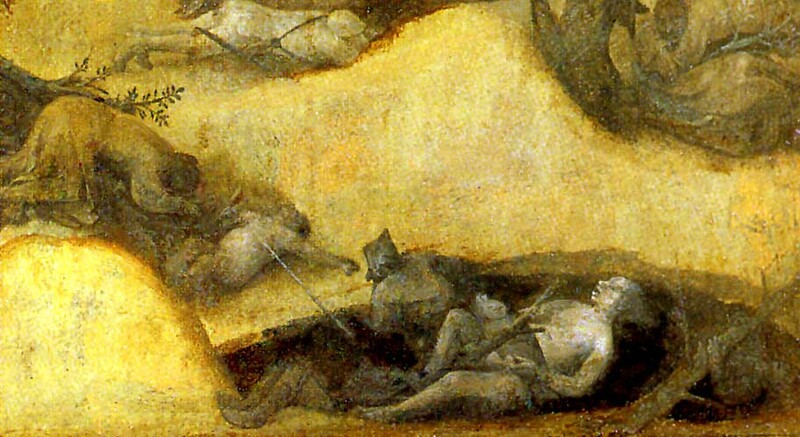 The psychological handling of the faces, the compositional arrangement of the figures, and the saturation of the pigments are in telling contrast to Bosch. Van der Weyden was a widely traveled painter, and this altar, one of the prime examples of the Northern Flemish Renaissance, is indebted to contemporary Italian painting which Bosch 's paintings were not. 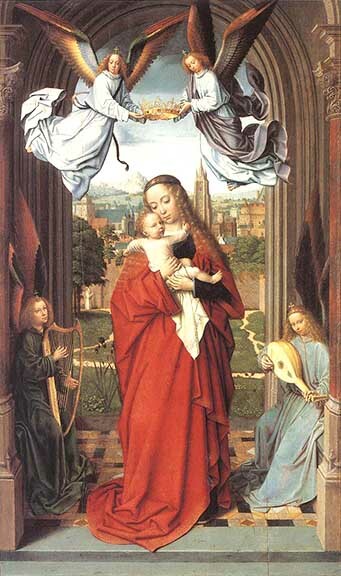 The other, possibly better know altar piece by van der Weyden, is in the Hôtel de Dieu, the public hospital in Beaune, Burgundy. With a width of 5.60 m it is one of the largest paintings of the fifteenth century. 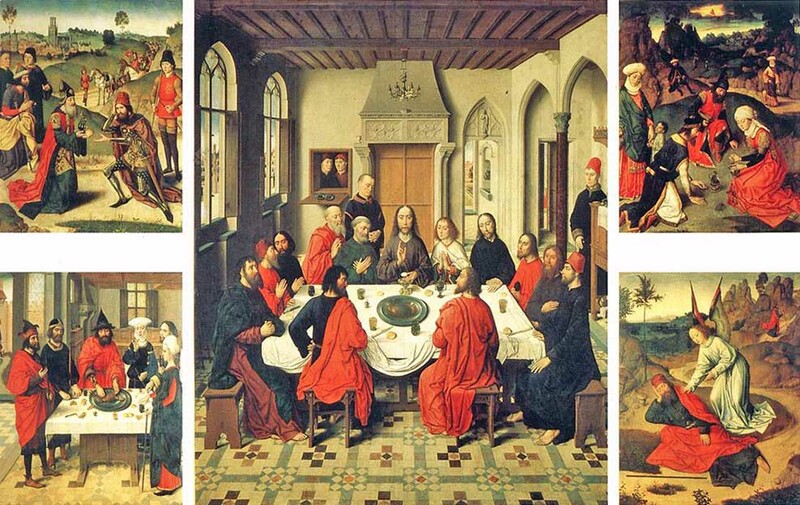 Van der Weyden had a large shop staffed with excellent students, whom he must have engaged in painting this polytych. Noteworthy is the then still prevalent, conventional middle panel with the Angel of the Last Judgment weighing the souls, who have emerged from their graves. Dieric Bouts the Elder and presumably Bosch had a different view of the Second Coming of Christ. 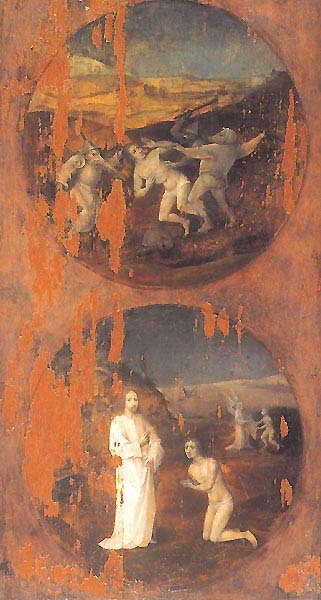 Bosch painted a last triptych a year before his death. The middle panel is lost, the wings, discovered almost accidentally in Spain in 1926 are in poor condition. 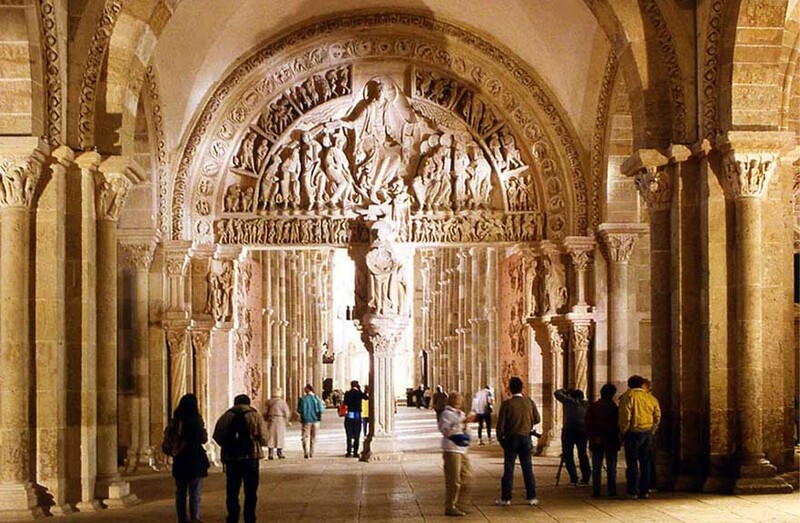 They were restored only in 2000 after dendrochronology had confirmed their authencity. They are the main source for Jacob van Almaengien's life before 1477 and Sibylle's death.. In the first tondo Jacob is kneeling in front of Sibylle's father's house. Sibylle dressed for the Yom Kippur celebration comes running from the flames. The next two tondos show Jacob being thrown from his horse and robbed by Orthodox "Nephelim." In the fourth tondo he has the vision of Christ and an angel brings him new clothes. Fraenger read the left panel as showing the Tribe of the Nephelim living on the Red Sea. They were the original devils, the off-spring of the fallen angels and the daughters of Adam, who were drowned in the Great Floos. 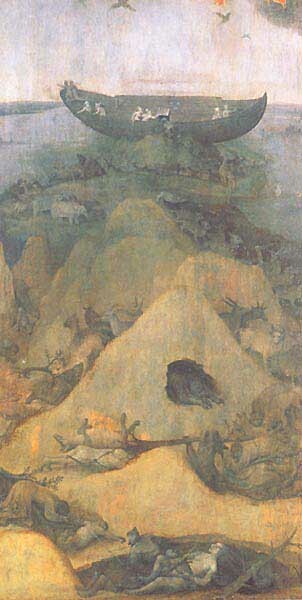 In the right panel Bosch shows Noah's Ark stranded high on a hill after the Flood. At the very bottom in one of the last puddles of water one distinguishes a drowned woman with her child and a man kneeling next to her. 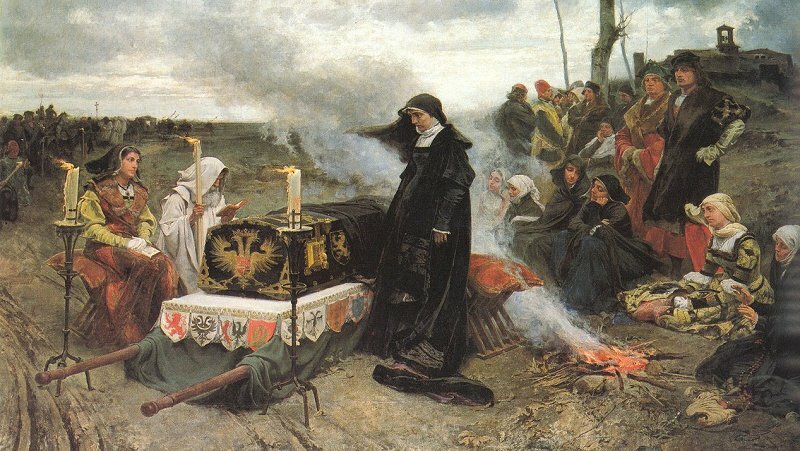 Sicut erat in Diebus Noë or the Great Flood, (enlargement of right panel) Sibylle and her dead child after the stormflood of 1477, 1515. Jacob kneeling next to dead Sibylle and her child.